Firewalls are a well-known security essential, and we’re certainly big fans, but did you know a firewall alone is not enough to keep your business safe? It’s true. It’s like building a fence around your house to keep the burglars out: You feel safe, private and secure… but the reality is, anyone with a ladder, enough motivation or ninja skills poses a real threat. That’s why despite every networked business having a firewall in place, security breaches are increasing at an alarming rate – further protections are still needed. 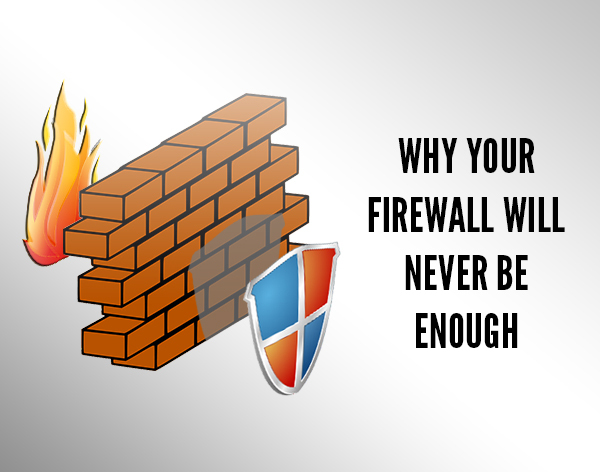 While not enough by itself, your firewall is still your first line of defense. However, there’s a huge difference between the generic firewall that comes standard with your Windows installation, and one specifically chosen for your business and set up properly. Our technicians work with our clients to identify which traffic should be allowed, such as remote employee access, and which should be automatically blocked. We help our clients give employees access to only the files they need to do their job. It’s not a matter of trust, but rather one of security. If they were the one to accidentally let the attackers through the firewall, perhaps by clicking an email link, you’re then able to limit the damage. Without this added layer of protection, it’s relatively easy to access any and all files. More secure than simply password locking a file, this uses a secret ‘key’ to scramble the files and their contents, so that when anyone else tries to view them all they see is incomprehensible nonsense. Our technicians setup encryption systems for our clients so that approved users can use them normally while all files remain secure. Spark Hollow’s managed services ensure our clients are protected and all their security products are operating at 100% efficiency. Threat analysis, prevention, management and response are all included so your focus can remain on growing your business, Let us take care of the bad guys. Give us a call to learn more about multi-layered protections for your business.